As of January 2017, we will permit researchers to cite preprints, or pre-peer reviewed manuscripts, in their grant applications and end-of-grant review reports. Robert Kiley: "We hope the ability of researchers to cite preprints will empower them to communicate their research findings more quickly." A preprint is a complete and public draft of a scientific document, yet to be certified by peer review. This change will help us (and those reviewing grant applications) to get a more up-to-date picture of researchers' work. Preprints have been a common feature of physics and computer science for many years. They help researchers to share their findings quickly, easily and widely, and obtain useful feedback. But their adoption in the life sciences has been slow. Early attempts, such as Nature Precedings and the British Medical Journal’s NetPrints, attracted relatively few submissions and were closed. 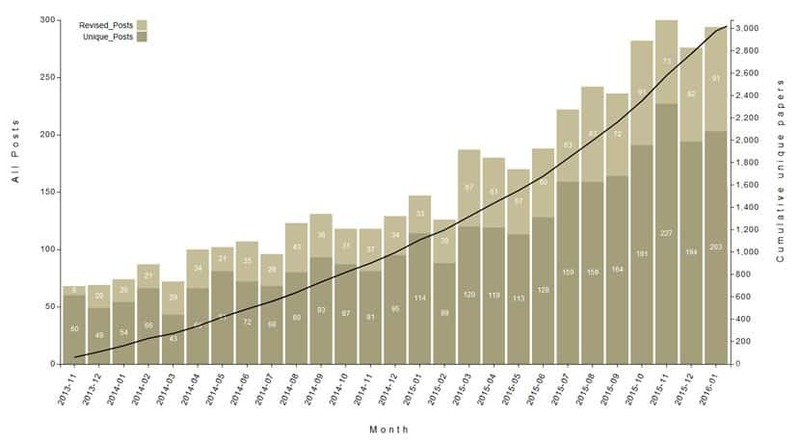 Recently, spearheaded by the ASAPbio initiative, there has been a resurgence of interest, as seen in the growth in submissions to the bioRxiv preprint server, supportive statements from other funders, and mandates from research groups. Robert Kiley, our Head of Digital Services, says: "We hope that the ability of our researchers to now cite preprints will empower them to make use of this technology as a way to communicate their research findings more quickly, and accelerate the discovery of new knowledge." Wellcome is working with other research funders to look into the value and feasibility of a central service for preprints. Such a service would bring together content from multiple preprint servers (eg BioRxiv, Peer J Preprints and SocArXiv) giving researchers and machines new ways to search, access and reuse it.